Today was Movement Exchange June 2015 Open Call’s first day and it was a huge success! After Tinna, Kim, Kate, Jen, Ruby, Hayley, Simone, Kourtney, Caile and I (Olivia) all piled into our big, happy yellow bus, we made our way to Colón to meet a group of incredibly loving, beautiful, and naturally talented kids ranging from about 4-15. We split our group up into two groups, one working with the younger ones, and the other with the pre-teens/teens. I personally worked with the teen group first and it didn’t take much time at all for them to warm up to us and fly across the dance floor (sometimes the grass! Lol). They were all so eager and hungry to learn, and had so much natural talent and energy to give back! Although some were more shy at first, by the end everyone was rockin out to an Azonto inspired choreography by Kim! 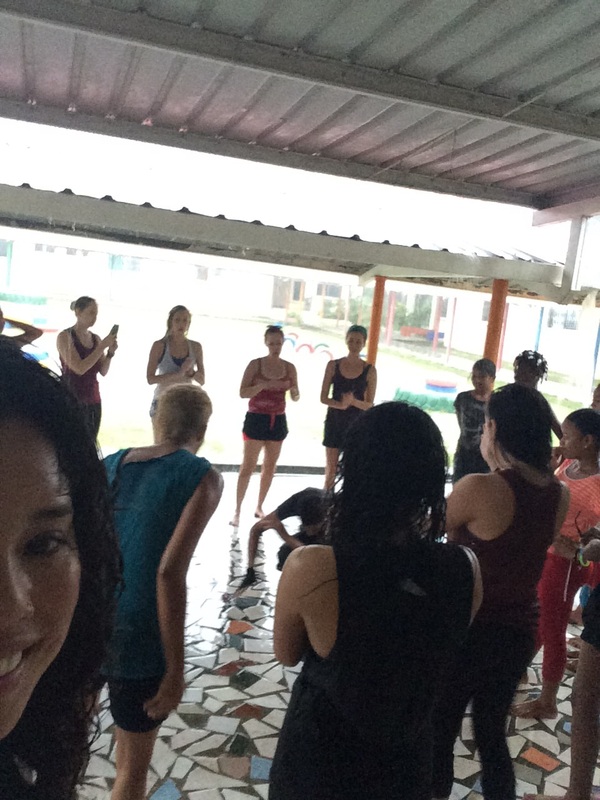 After this we switched groups are were working with the younger ones…and that’s when the downpour started! But no one was phased by the rain we kept on dancing regardless:). We ended up doing a multitude of many different activities with them from drawing to hula hooping to obstacle courses to hugs to just talking to them like old friends. They were just so energetic and full of love.